The PolystyreneLoop Foundation was established in early 2016 to demonstrate the technical and economic feasibility of the safe recovery of HBCDD – a brominated flame retardant used in Polystyrene (PS) foam insulation boards. The service life of PS Foam boards ranges from 30 to 100 years, and PS Foam only becomes waste at deconstruction of the buildings. As of 2020, there will be an increase in HBCDD-containing PS foam waste from deconstruction. Best practice of handling such waste is essential. The PSLoop demonstration plant (with the capability to handle 3 million tn of PS waste per year) is aimed to start up end of 2018. It is funded by many companies from the entire PS foam value chain, and has also attracted the support of a European LIFE Grant. The project will demonstrate the technical, economical and environmental viability of this new recycling process, and will lead on to further roll out the process at more plants in many countries throughout Europe. Since the 1960s, a flame retardant (HBCD) has been used in foam insulation boards. For many years, it was the best solution to ensure safety in case of fire and to meet national fire regulations. However, HBCD is now considered a pollutant. It can therefore no longer be used and has been replaced by another flame retardant. Millions of tons of PS foam waste can no longer be regularly recycled. A best practice agreement for the handling of this waste is essential. 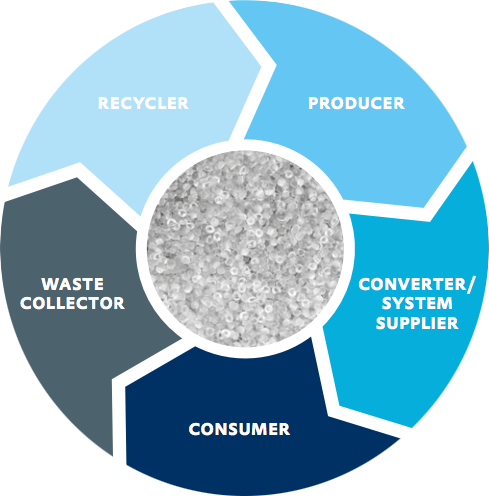 The PolyStyreneLoop recycling project contributes to the circular economy by introducing a recycling scheme for Polystyrene foams containing HBCD. A physical-chemical recycling process can now preserve the high quality PS, to be used as raw material for new foams. In parallel, this process safely removes the flame retardant HBCD from PS foam. The HBCD is destructed in a hazardous waste incinerator equipped with a Bromine Recovery Unit (BRU). This facility ensures the safe recovery of the valuable bromine component, to be used for new polymeric flame retardants. Polystyrene (PS) foams are known for their outstanding insulation and shock absorbing abilities. They are well tried and tested for use in various applications. After they have been used, PS foams remain a valuable material source for new raw material and for a variety of products. Especially in the packaging sector, there are already many effectively successful recycling systems in place throughout Europe. HBCDD-containing PS Foam waste is first collected, sorted and compacted. After compaction, the PS foam is dissolved, and HBCDD is removed by way of the CreaSolv® dissolution process. This process, developed by the Fraunhofer Institute and CreaCycle GmbH is the technology chosen for the recycling of PS foam waste; the resulting high-quality polystyrene recyclate can be used to produce new PS foam. The removed HBCDD is destructed in an existing hazardous waste incinerator operating at a temperature of 1100 ° C located at ICL-IP Terneuzen, and further processed in the adjoining bromine recovery unit (BRU), where bromine is recovered for further re-use. It creates a durable market place for PS foam products for the future. A high quality recyclate (Polystyrene and bromine) is obtained for re-use (upcycling). It receives strong support from national and EU authorities, in recognition of its contribution to the Circular Economy agenda. After proof of concept, the intention is to roll out the technology across Europe, in order to be able to handle an increasing amount of PS foam waste in the future. 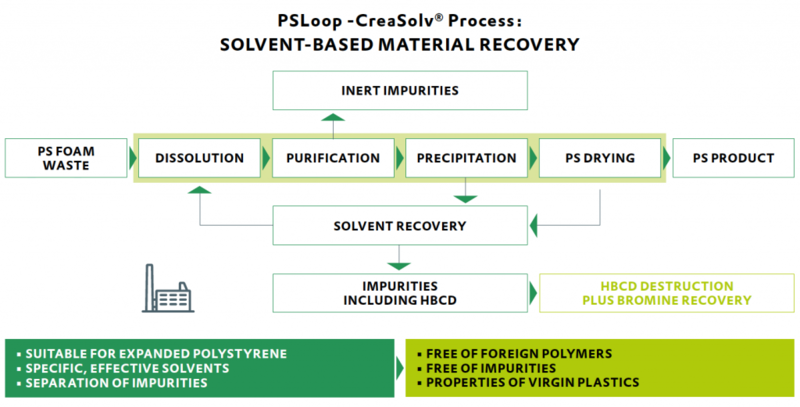 It uses a unique dissolution process for plastics with persistent organic pollutants (POPs), based on the CreaSolv® process. The project shows an innovative cooperative approach by bringing together PS foam partners from across the whole value chain. Experience and expertise are gained from the demonstration recycling plant, to prove the technical, economical and environmental feasibility of the CreaSolv® technology.